A few days ago I wrote the top 5 things I do MORE of … now that I have the Maxis WiFi Modem, so today I’ll share what are the top 5 things I do LESS of … now that I have the Maxis WiFi Modem. 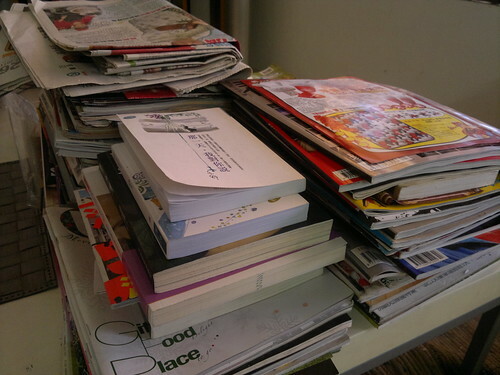 Piles of books, magazines, novels and newspapers on a messy table at my friend’s house. Maxis WiFi Modem really provides the maximum mobility to me so I’m less dependent on wired broadband or WiFi hotspot now. I can connect to the modem using my mobile phone or Apple iPad when I’m out of home or office, even in my car! I’m not so worried about the battery life of my mobile phones now because I’m connected to Maxis WiFi Modem using WiFi signal. This will significantly reduced the power consumption (save up to 50%) as compared to connecting to a 3G data network. Now my Samsung Galaxy S can easily last for the whole day without the need to reduce the time and frequency I connect to the Internet. Another thing I’m less worried is the security of Maxis WiFi Modem as it provides a number of features to secure the wireless network that I’m sharing using Maxis WiFi Modem. Now I’m able to work more and worry less. Blogging on the go is something that I love and hate at the same time. I love it because I can instantly share things with my blog readers when I’m away from the PC and can still be connected without them. I hate it because I used to do it using my phone with the smaller screen size and keyboard as compared to what Apple iPad has. Now with Maxis WiFi Modem, usually I’ll snap pictures using my phone then upload it to my Flickr account while I’m composing the blog post using Apple iPad. Both devices are connected to the modem at the same time and it really saves a lot of time. I wrote this post using exactly the same way. Can we use mobile 3g connection for browsing internet througth ipad?